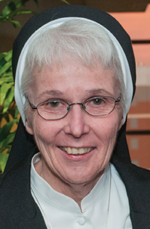 Sister Maureen McGarrity, C.S.F.N., new president of Holy Family University. Sister Maureen McGarrity, C.S.F.N., has been named president of Holy Family University, according to a university announcement May 14. Currently the university’s provost, she succeeds Sister Francesca Onley, C.S.F.N., who announced her retirement in January. The appointment becomes effective July 1. As provost, Sister Maureen oversaw enrollment management, marketing and communications, institutional research and student life, as well as all the areas comprising academic affairs. She has served in leadership positions during several Holy Family re-accreditations, and served as associate professor, department chair, division head, dean, vice president for academic affairs, and associate provost for academic services. Sister Maureen believes strongly in online blended learning formats, the continuation of accelerated degrees and providing more students with the opportunity to pursue a Holy Family University education. “Our size and openness to innovation has served us well and we will continue to be creative in responding to the needs of our constituents,” she said. Sister Maureen holds a Ph.D. in microbiology with a specialty in immunology from St. Louis University and a master’s degree in biology from Villanova University. Holy Family University is a Catholic university offering 45 undergraduate, graduate and accelerated degree programs. The university’s main campus is in Northeast Philadelphia with additional locations in Bensalem and Newtown. It was founded in 1954 by the Sisters of the Holy Family of Nazareth as a private, not-for-profit, faith-inspired community.